Black bamboo, Phyllostachys nigra, is one of the more popular bamboo, if not the most popular, of ornamental bamboo species around the world. Although widely grown on a commercial level, it appears that it may no longer be common in the wild and could be hard to find in what would be classed as its original natural location. Black and very glossy culms, edible shoots, and harvested material for crafts are among the uses for the culms, although in order to maintain their colour for such uses they need correct drying processes. Phyllostachys nigra was one of the earliest bamboos to be introduced to the UK and US in the first half of the nineteenth century. An appreciation of bamboo with black culms grew, along with their popularity as a woody plant, and following the growth in interest other species were introduced later in the century. Phyllostachys nigra is generally known to be quite controlled in its spread, being a clumping bamboo they will not usually be liable to spread except in some conditions such as if it is located somewhere exceptionally warm, cool, or in areas where the soil is very dry as it may go hunting for moisture. Having said that, a clumping bamboo can be quite large over the course of years of growth and you should therefore leave enough room around the plant to cater for the growth within the clump, and some sources report Phyllostachys nigra as a running bamboo. I therefore wouldn’t plant it in a small garden unless in a container. Over 10 years this species could spread from 75 cm. to 1.5 m (2.5-5 ft.). Location and climate plays a big part in the growth of bamboo plants and therefore each one may differ in height and spread according to the localised conditions and health of the plant. In the same country for example, some may reach a height of only three metres (10 ft.) whereas others will be known to achieve heights of 8 or 9 metres (30 ft.), and even up to 12 m (40 ft.). Similarly the thickness of the culm also varies and is often dependent on the height of the bamboo. Tall culms will generally achieve a wider measurement than shorter culms. A maximum diameter of 5 cm. (2 in.) is usual. 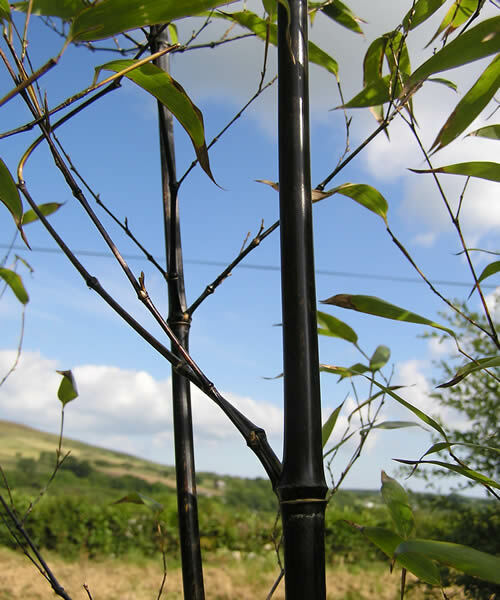 If your plant is healthy you should see plenty of new Phyllostachys nigra bamboo shoots and culms during the growing periods as the plant mature, although juvenile plants can take a while to mature. 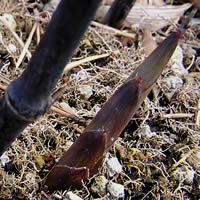 The emerging shoots of black bamboos are often a kind of dusky pink colouring when they first appear with the colour changing as they grow into culms. Where the culms are really true black, under each node, there will be a sheath scar ring around the culm that can have the appearance of being practically white. The white ring against the shiny black culm really stands out and adds to the dramatic appearance of these bamboos. Before the culms turn black, as new culms, they are a dark green colouring that over time turns to a mottled black and green before they finally turn to a beautiful shiny black. To turn completely black can take couple of seasons but some culms turn black quicker than others. The strength of the black colour can be dependent on the amount of full sun they receive, with full sun being a contributor to the culms turning black. 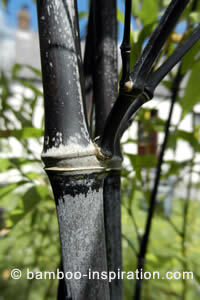 So if you want shiny black culms it is recommended to locate your black bamboo in full sun. They need a high level of sunlight as the level of light effects the colour development of the culms. 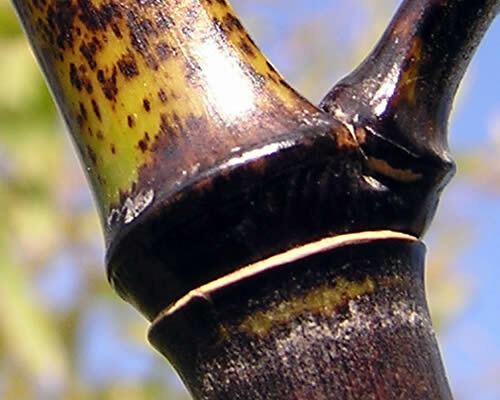 To expose the black culms for best aesthetics you will need to remove branches from the lower levels of the culm once it has achieved maturity. This will be particularly relevant if you have a very tight clump where you may need to remove branches at the lower levels to appreciate the black culms rather than have it look more like a large bush. It is good maintenance to take out small and old culms anyway. If you particularly want a plant with deep black culms you would be advised to check the plant thoroughly when you buy it as they are not all equal in colouring. For example, see if the plants have any culms from last year’s growth that show they have turned, or appear to be, practically black. 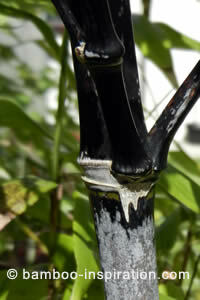 If there are year old culms that are already black or mostly black you will probably have a good culm colour. If there are older culms that are still mostly green and do not appear to be turning to black very quickly it may not be a very good example plant and may not achieve the black culms you are looking for. Although in this case I would really want a bamboo plant that produced jet black culms, I do find the mottled black and green of growing culms to also be attractive. Culms do have a lifespan, the older culms change as they get old and juvenile culms die off. In the case of black culms, as the plant matures the juvenile culms get replaced by bigger culms and the old ones tend to lose colour and change to grey, and even stop growing new leaves. When the plant is mature you can cut out the old culms to tidy up the clump. However, do not do this during the shooting season as new growth may be connected to the old culm and you may weaken or kill the new shoot. Wait until autumn and if your plant is mature you can cut out old culms. To be sure you don’t sever important culms, choose ones that have had no leaf growth in that growing season, or have minimal leaves in comparison to the rest of the plant, appeared in poor health, or that you know are probably about 5 years old, or a minimum of 3 years. 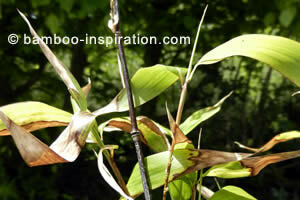 Image: Black Bamboo / Phyllostachys nigra branches, culms, and leaves. Black bamboos can get a dense canopy of branches with foliage with some plants being prone to an arching habit. However, you can prune this species easily enough if you want to make a thicker hedging type of growth and/or prevent any arching habits where they are not wanted. 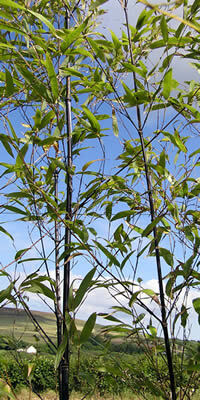 For Phyllostachys nigra the leaves are considered to be quite small at 8 cm by 1.3 cm, (0.5 to 3 in). During the winter you’ll notice the finer leaves may go pale or brown off at the tip. Sometimes you may experience most of the leaves going completely brown and dropping. This is nothing to worry about and it appears to be quite normal for this bamboo. Mine look alright over the winter but terrible through the spring after taking a battering from cold winds. Then at the end of spring, just when you think the whole thing is dying, you’ll notice new leaf growth. Hang on, it will recover, bamboo produces new leaves every year it’s just that black bamboo seems to be a bit slower in doing so. As an ornamental and evergreen plant, Phyllostachys nigra is easily recommended for landscape and bamboo garden projects, it makes a great bamboo hedge, windbreak, or privacy screen, looks fantastic in containers, and can be planted anywhere provided it gets sufficient sunlight and the sun is not completely blocked out resulting in it being in full shade. 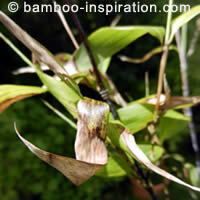 You can plant it with other culm coloured bamboo species for effect, or it will look equally effective on its own. Because of the neutral colour of the culms it will fit in with any other garden plants, colours, or structures. There are a few varieties of Phyllostachys nigra so for the purpose of this page about black bamboo I am listing those that have culms that turn black, not those that remain green, mottled, or other colouring. Phyllostachys nigra f. nigra - Growth is not as strong but it has a really good colouring of the culms practically immediately. Phyllostachys nigra ‘Daikokuchiku’ - Reported to have fast culm colouring with excellent growth that exceeds that of others. I heard somewhere that this one is a clone that comes from California.